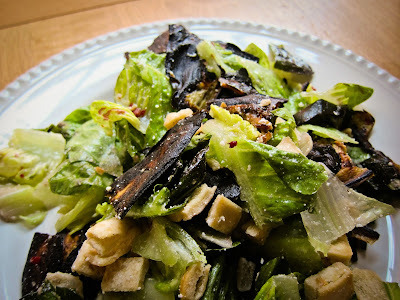 Since I had an eggplant in the fridge and didn't know what to do with it, I crisped it up and added it to my Caesar salad. It turned out delicious!! - Cut the bread into cubes, drizzle olive oil, add the minced garlic and bake on 150 C degrees for 30min. When the croutons are crispy, let them cool down. - Peel and thinly slice the eggplant. Put some salt on each slice and let it stand for about 30min so the bitterly water comes out. Then fry in hot oil until crispy and let it cool. When cool cut into bite-size pieces. - To make the ceasar dressing, squeeze the lemon in a salad bowl, then add the anchovy paste and cheese. - Add the lettuce, and give it a stir. Add the croutons and eggplant pieces and enjoy!